The VolturnUS floating wind turbine in June 2013. Some disappointing news came today for the deep water wind project known as Aqua Ventus. That's the pilot project led by a University of Maine development team. Aqua Ventus was competing for federal development money. But, as Jennifer Mitchell reports, the project was not selected for full funding. So now, its fate is less certain. Meanwhile, environmental advocates are still lamenting a decision they say chased away another wind developer. Jennifer Mitchell reports on Aqua Ventus' grant status. Aqua Ventus is a runner up - the fourth of six projects considered for funding under a U.S. Department of Energy program. While the first three projects were fully funded by the DOE, Aqua Ventus will receive $3 million for further research and development - a figure far smaller than the $47 million the group was seeking. "it is disappointing because it was a path that was fairly well laid out," says Jake Ward, vice president of innovation and economic development at UMaine. With the grant, he says the project would have been funded to completion. What happens now is unclear. Ward says the consortium was hoping to use the funds to move from the research phase to the construction and placement of two turbines near Monhegan Island. "There may be other sources of funding that would fund a smaller project - perhaps a single turbine, or perhaps turbines located in other places," he says. "What we do know is that having 100 percent design and engineering complete will lead to the marketablility of the technology." So the project isn't dead, Ward stresses. One of the DOE's top three picks for grant funding was another floating platform design for offshore wind, developed by Principle Power in Oregon. The Aqua Ventus project is similar, but seeks to become the first of its kind, using new composite technology developed at the University of Maine, rather than steel. A year ago, the development team celebrated the successful launch of its demonstration project, VolturnUS, which became the first such project in North America to send power to a grid. The eventual goal is to harness more of the powerful energy blowing off Maine's rocky coast, with the development of a 500-megawatt farm. But that vision is now slightly smaller on the horizon, to the dismay of environmentalists. "It's particularly upsetting, I think, if we see this in the context of what's been going on with offshore wind efforts in Maine," says Dylan Voorhees, of the Natural Resources Council of Maine. Voorhees says Gov. 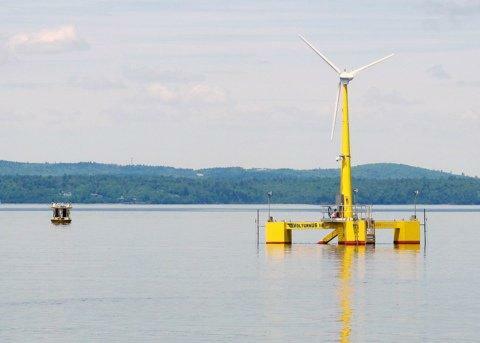 Paul LePage last year chased away an attractive suitor for Maine's offshore wind industry, Norway's Statoil, which was poised to develop a $120 million offshore wind project. The company, having received a nod from the Maine Public Utilities Commission, pulled out after the process was opened up to bid to give U Maine a chance to compete - a move seen by some as an attempt to diminish the chances of a project succeeding. Voorhees says while the University-led project has done fabulous work, offshore wind isn't gaining enough traction. "What we really need, clearly, is a partnership between the university, the government, state and federal and private investors," he says. "That's what's going to make offshore wind happen in Maine." While environmental advocates are disappointed, Democrats are wondering what the headline would have been if Statoil was still invested in Maine - either on its own, or perhaps in partnership with the UMaine project. "Neither one are moving ahead," says Maine Senate President Justin Alfond, "and instead of being able to move our state forward as a world leader, a world innovator in renewable energy, we now are struggling to figure out how we're going to bring in outside capital." "It's hard to know whether the competition from Statoil would have rendered a different result - Principle Power has been identified as one of the premier technologies on the West Coast," says Patrick Woodcock, director of the Governor's Energy Office. Woodcock is one of the people, along with Gov. LePage, being blamed by Democratic legislative leaders for Maine's failure to obtain federal funding for a viable offshore wind project. But Woodcock says the news that Aqua Ventus did not get a bigger grant doesn't mean the project is dead. In a joint statement, Sens. Susan Collins and Angus King said the $3 million promised to Aqua Ventus means that the DOE recognizes the project's "enormous potential." While Maine's Congressional delegation searches for the silver lining, members of the Monhegan Energy Task Force, a group which had raised the question of impacts to their community from the Aqua Ventus turbines, said the group will continue to see how things develop in the area, but will assume that the project will still be going forward. Patty Wight contributed reporting to this story.